Since March 2014, there has been an ongoing community consultation process to look at the future of the Canada Water Masterplan area. 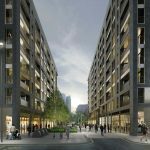 This includes redevelopment of the SE16 Printworks Site (formerly known as Harmsworth Quays), the Surrey Quays Shopping Centre Site and most recently the Surrey Quays Leisure Park Site. 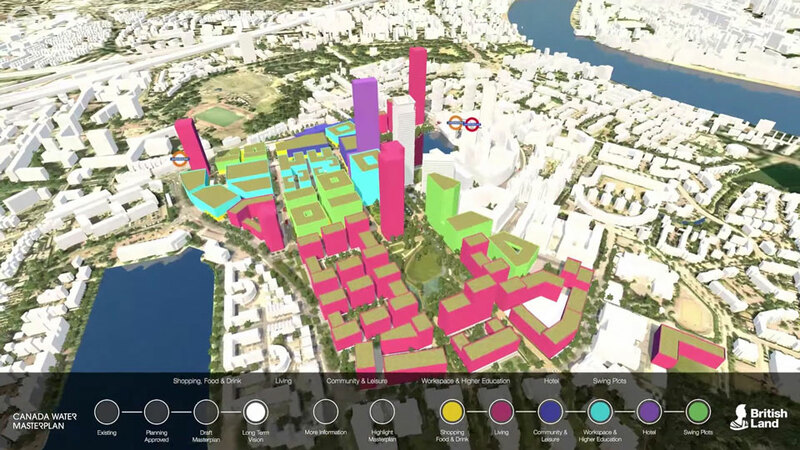 British Land is working with Southwark Council to bring forward a mixed-use development for the Canada Water Masterplan, as part of a new town centre for the area. Allies & Morrison are the masterplanners and have been developing initial ideas, informed at every stage by the input and feedback from the community consultation process. We presented an innovative and pioneering way of testing and showcasing the multiple masterplanning options for the site. 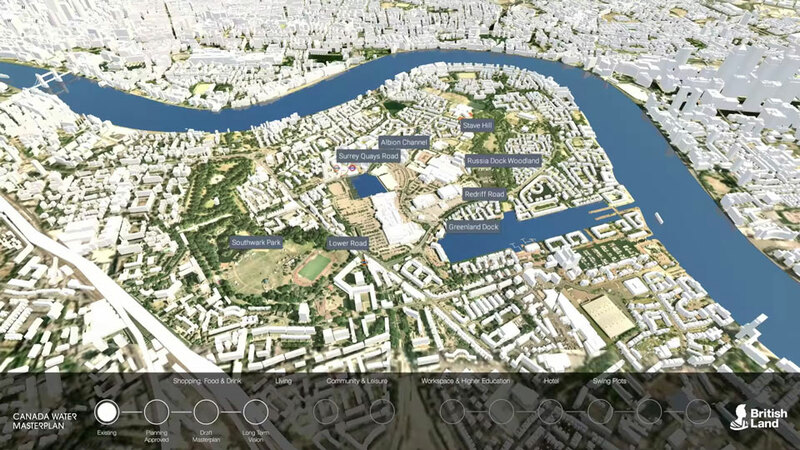 As a result, our digital interactive 3D communications tool, VUITNOW, formed the primary 3D engagement tool in their community consultation about the redevelopment proposals for Canada Water. 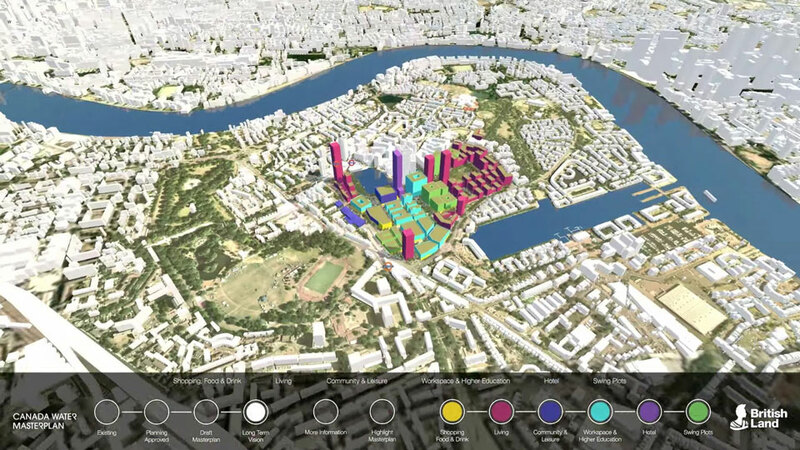 In February 2016 British Land held Draft Masterplan exhibitions to share the emerging plans to help inform how they develop over the coming months, with the primary focus being our interactive touchtable, with which the development team could demonstrate the draft masterplan in the context of the wider area, overlaying key information to help communicate the many facets of this multi-million pound project. 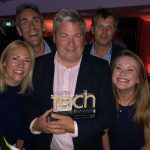 Whilst computer generated still and flythroughs have long been the preferred route to illustrate developments, as people become more sophisticated in their technology usage, so too are their expectations when it comes to stakeholder engagement through to construction and marketing. Our 3D digital consultation tools were therefore recognised as a new way to showcase development in an easily digestible way, with greater emphasis on personal preference and the individual’s chosen route to looking at the development proposals. 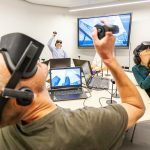 Visit VU.CITY to find out more about VU.CITY, creators of the largest and most accurate interactive digital city models.